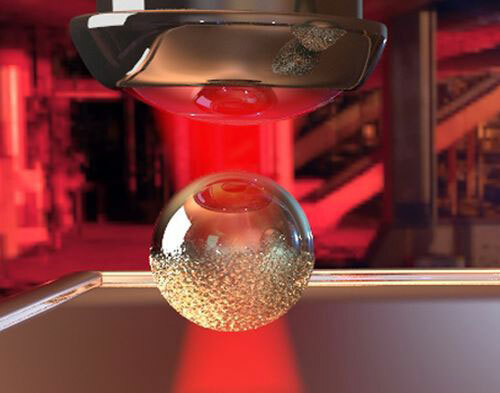 (Nanowerk News) Glass nanospheres coated on one side with a very fine gold film: LMU scientists have shown that particles modified in this way can be moved about with high precision using laser beams, creating an optically controlled micro-elevator. They owe their name to the two-faced Roman god Janus. Symbol of the turning year, Janus looks back and looks forward at the same time, just like so-called Janus particles, which display two different faces to the world. A research team led by the NIM physicists Professor Jochen Feldmann and Dr. Alexander Urban, both LMU München, has now synthesized a class of Janus particles which, thanks to the distinct properties of their two hemispheres, can be manipulated with unprecedented precision with laser beams (ACS Photonics, "An Optically Controlled Microscale Elevator Using Plasmonic Janus Particles"). Tiny glass nanospheres coated on one side with a very fine gold film can be moved about with high precision using laser beams, creating an optically controlled micro-elevator. Urban’s team has now overcome this limitation, by using quite a simple trick: The scientists introduced an asymmetry into the system by coating glass nanospheres with a wafer-thin layer of gold on one face. This layer is only 5 nanometers thick, about 20 times thinner than gold leaf“, says Urban. The gold-coated hemisphere of such a so-called Janus particle heats up when irradiated by the laser beam, while the glass side is unaffected because it is not metallic and does not conduct heat. If such a Janus particle is placed in water, heating of the gold surface generates a temperature gradient, which causes the particle to move upwards toward the light source. How far it moves and in which direction can be precisely controlled by modifying the balance of forces exerted by the laser on the particle: Scattering forces control the orientation of the particle in space and confine it within the beam, while the intensity of the laser can be used to alter the level of heating and hence to regulate the distance traversed by the particle in the third dimension. Thus, by varying the laser power, the researchers can raise or lower the level of the particle within the laser beam, as if it were a passenger in an elevator: Increasing the intensity of the beam causes the particle to rise; reducing the power results in downward motion. “This new technique allows one to control particle motions with unprecedented precision and can be used in many different and interesting settings“, says Urban. Indeed, the scientists have already taken a further step by successfully using laser beams to capture a gold nanosphere together with the new Janus particle and then showing that they could change the distance between the two particles at will. “This demonstrates that our laser-powered ‘elevator’ provides a versatile tool for use in basic research as well as in many practical applications. It could, for example, serve as the basis of a device for the measurement of extremely weak forces, in which a molecule is suspended between particles and one could use the laser to measure the force required to pull the particles apart,” says Urban.